Although not a new Regal model for 2011, the Canadian debut for this exciting 42 Sport Coupe was at this year`s Toronto International Boat Show. It is one of six Sportyachts ranging from thirty-five to fifty-two feet from this Orlando, Florida-based company with a family ownership and history going back over forty years. Regal also builds a full line of Bowriders, Cuddies, and Express Cruisers from nineteen to thirty-five feet. At almost every glance it might appear that this boat was specifically designed with Canadian boating and weather conditions in mind. Consider these features. A power operated convertible hardtop with wrap-around windshield and fully enclosed side windows to let in or keep out the weather depending on temperature and severity or on your mood. The opening sunroof portion of this hardtop is virtually the full width of the top and offers a whopping 38 square feet of fresh air when open. It also allows full stand-up access to the foredeck through the opening centre section of the windshield. In addition, an optional solid cockpit enclosure with sliding glass door and opening windows again allows you to choose to enjoy or to keep out the weather without having to “fight” any canvas whatsoever. Can’t get much more Canadian than that! The cockpit of the 42 Sport Coupe is huge and remarkably all one level to make entertaining a pleasure and it provides seating for a total of twelve persons. A “Euro” sunpad at the transom will accommodate up to four and has a multi-position chaise lounge backrest. A foredeck sunpad with chaise lounge is standard equipment as are many other features on the 42 Sport Coupe which are often optional on other boats this size. A cockpit wet bar with Corian® counter and refrigerator is standard as is a double wide helm seat with electric fore and aft adjustment. Through the sliding bronze-tinted and screened cabin door, you will find the layout below of the salon and staterooms slightly different than the usual. All cabinetry throughout is solid satin finished cherry wood, not veneers. In the master stateroom forward, the queen-size island bed with innersprung mattress with standard fitted sheets is slightly offset from centre to accommodate a separate private master shower room to starboard while the private master head with Corian® vanity top, porcelain sink, and electric silent flush toilet is to port. This stateroom has its own 22-inch LCD TV with DVD. 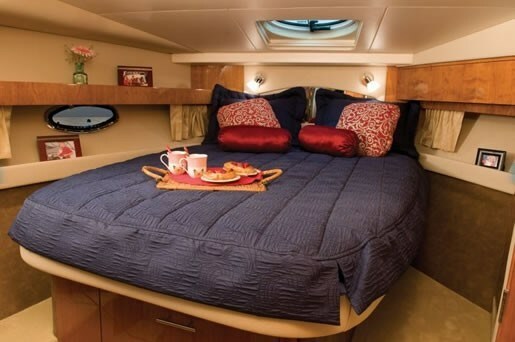 The aft guest stateroom offers twin beds with innersprung mattresses that can convert to a queen. Back here is the guest head with integral shower and separate vanity, sink, and storage. The standard central vac system is housed here. The salon features a sumptuous C-shaped sofa covered in UltraLeather® with a high-gloss cherry table, all of which converts for additional sleeping. A 32-inch Samsung ultra thin TV and Bose 321 Home Theatre system satisfies the entertainment requirements. The galley is fully equipped with Corian® countertop, two-burner electric stove, microwave/convection oven, refrigerator/freezer and hardwood flooring. Opening salon/galley portlights are huge parallelograms in shape and equipped with screens and wood blinds. The hull of the 42 Sport Coupe was specifically designed to maximize the benefits of Volvo Penta’s IPS propulsion system. You can choose from three of these; one gasoline, and two diesel. The gasoline choice is twin 8.1 Gi IPS 550 with Joystick control at 400 hp each. 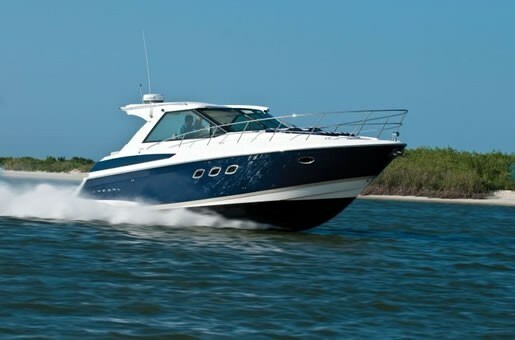 Regal claims that the boat cruises at a remarkable 33 mph with the twin D4 IPS 400 diesel package with Joystick control producing 300 hp each. You can also opt for the larger twin Volvo Penta D6 IPS 500 diesel engines at 370 hp each. Electronic throttle and shift with Joystick is standard for all power choices. Whatever your power choice, either a 7.3 Kw Kohler gas or 7.6 Kw Westerbeke diesel generator is standard as is a 32,000 BTU reverse cycle air conditioning/heating system. Because of the very complete standard equipment that comes with the 42 Sport Coupe, the factory installed option list is fairly short. You can order more TV’s with or without satellite capabilities, various canvas covers and curtains, plus additions to cockpit amenities including tables, icemaker, and an electric grill. You can also go really fancy with electric shore power and water hose retracting reels with remote controls. Of course there is a selection of optional Garmin electronics upgrades including a camera monitoring system, a second plotter screen, auto pilot, and radar. But you can also simply boat away with no options whatsoever since the 42 Sport Coupe comes “turnkey ready” from the Regal factory with Danforth anchor, roller, windlass, and chain, lines, fenders, boat hook, deck brush, safety equipment including jackets and fire suppression and extinguishers, plus linens, towels, dishes, and utensils! You can’t get much better than that.